Summer is the season of track work in the railroading world. Throughout the warmer months, American railroads send out their maintenance-of-way equipment to repair the winter's damages. Our passengers may be familiar with notices concerning track repairs across the country in this season. The work shown above took place on Amtrak's Northeast Corridor in 1978. This particular work actually began in Congress in 1976 with the passage of the Railroad Revitalization and Regulatory Reform Act, which authorized Amtrak's acquisition of the Northeast Corridor. In that year, Congress also authorized the Northeast Corridor Improvement Project (NECIP) to begin a major overhaul and improvement of the line between Washington and Boston. 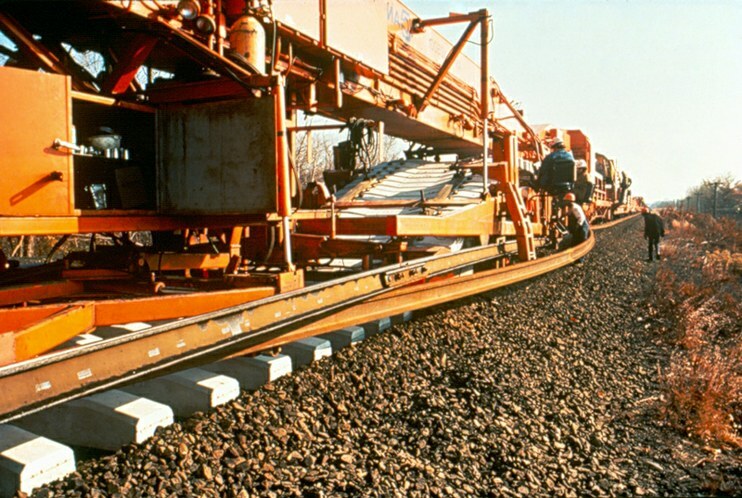 In 1978, the heavy track work in the Northeast included the first significant use of concrete ties, and the machine shown above actually rode on the rails as it replaced them. In one operation the Track Laying System (as it was also called) took out old rail and wood ties, plowed away the ballast, and then laid new concrete and wood ties and continuous welded rail. The purpose was to provide a smoother and safer ride for passengers as well as literally laying the groundwork for high-speed rail service.